Large Eden handled dish - 16¼" (412 mm) wide, 8¼" (209 mm) high. 2001. Victoria and Michael Eden set up their first pottery at Multum-in-Parvo, Kendal, Cumbria in 1981 - the year they were married. Vicky was previously potter in residence at Wolf House Gallery, Silverdale. In 1987 they moved to their present premises at Hale near Milnthorpe in Cumbria. They make slip decorated earthenware - both electric and wood fired. The decoration is innovative but not overstated and some of the forms are quite original. Their domestic ranges are usually electric fired and the larger one-off pieces are fired in the single-chamber down-draft wood kiln that Michael built. Michael and Victoria run courses in ceramics and are kept busy with workshops and demonstrations. They have given demonstrations from Scotland to Budapest and their work is exhibited and retailed world-wide. 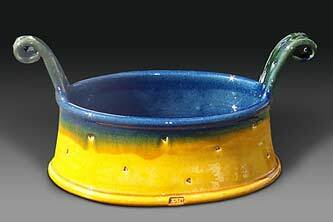 They are the co-authors of a book; Slipware: Contemporary Approaches - an essential reference. You can visit their web site at www.edenceramics.co.uk.